This #GivingTuesday – November 28 – the Children’s Trust is asking our supporters to donate your Facebook feed to our mission to stop child abuse. Not only is Facebook waiving their donation fees on Giving Tuesday, but they are partnering with the Bill & Melinda Gates foundation to provide $2 million in matching funds for the first $2 million that comes in, starting at 8am. There are countless reasons to #Give4Kids, but we think one of the most important ones is that we know that together, we can stop child abuse and neglect. Our programs have proven again and again that given the right supports, parents and their children can thrive. If you agree that every child deserves to grow up in a nurturing, safe, and loving environment, then please consider joining our #Give4Kids campaign to help build momentum for this important cause. There are many ways to participate. You can use these tools, RSVP to our Facebook event, create a fundraiser, and use our Facebook frames to share some reasons why you’re giving or why your friends should. 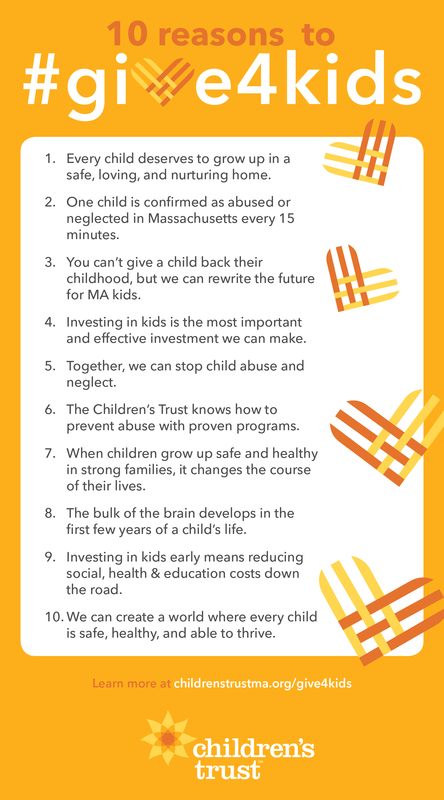 Please help us spread the word that together, we can rewrite the future for Massachusetts kids.